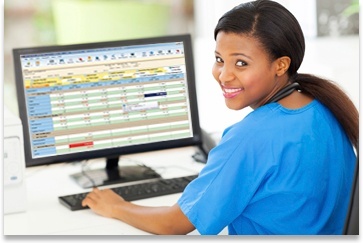 Developed with clinicians to ensure widespread clinical use, Visual Flowsheet Suite facilitates highly efficient online assessment and documentation of patient care, and is the perfect solution when your hospital implements online flowsheets, eMAR, or a nursing status board. 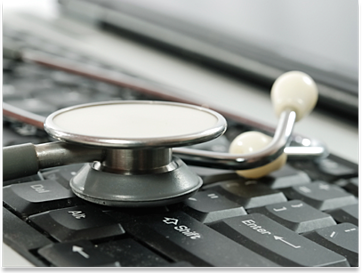 of patient data to improve efficiency. required to access and document patient care. 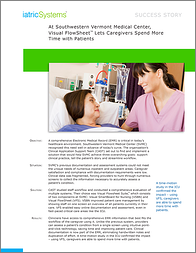 Learn how nurses at Southwestern Vermont Medical Center are able to spend more time with patients by using Visual Flowsheet. Presents clinical decision support information on one screen minimizing keystrokes. Provides physicians a total picture of the patient’s health. 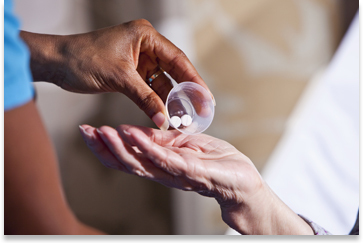 Caregivers have control over the data and are able to point, click, assess, and treat. Integrates with existing MEDITECH systems. Iatric Systems Visual Flowsheet version 3.0 has achieved ONC HIT 2014 Edition Modular Inpatient EHR certification, which designates that the software is capable of supporting eligible hospitals with meeting the Stage 2 meaningful use measures required to qualify for funding under the American Recovery and Reinvestment Act (ARRA). Visual Flowsheet 3.0 was certified on April 30, 2014 by ICSA Labs, an Office of the National Coordinator-Authorized Certification Body (ONC-ACB) and is compliant in accordance with applicable criteria adopted by the Secretary of Health and Human Services (HHS). Visual Flowsheet 3.0’s certification number is 140067R00. ONC HIT certification conferred by ICSA Labs does not represent an endorsement of the certified EHR technology by the U.S. Department of Health and Human Services. Visual Flowsheet 3.0 meets the following certification criteria: 170.314(a)(16) 170.314(d)(1) 170.314(d)(5) 170.314(d)(6) 170.314(d)(8) 170.314(g)(2) 170.314(g)(3) 170.314(g)(4). The additional types of costs that an eligible hospital or critical access hospital would pay to implement this EHR MODULES’s capabilities in order to attempt to meet meaningful use objectives and measures include: handheld barcode scanners.